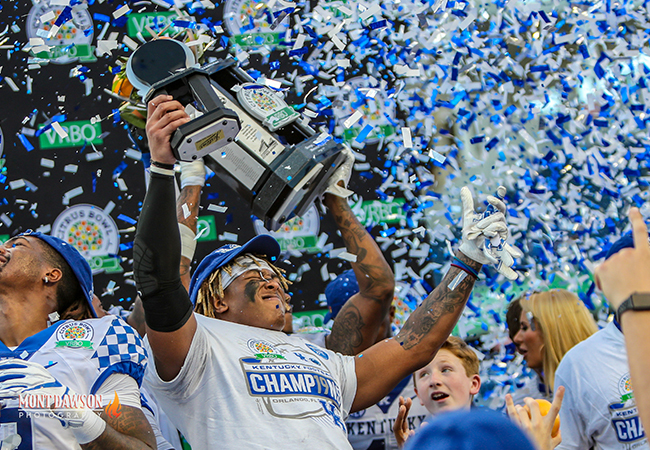 Kentucky football is not used to a season ending with confetti all over the field and a championship trophy being passed around for players to enjoy—or even having a head coach dancing in the locker room. 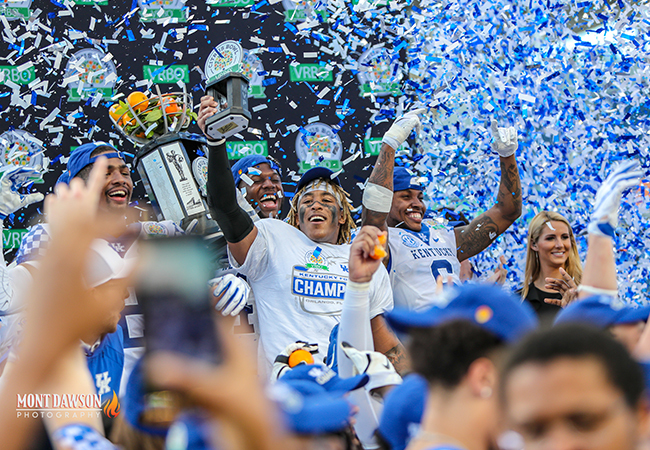 However, that’s what a 10-3 season feels like after Kentucky secured a 27-24 victory over Penn State in the Citrus Bowl in Orlando that turned out to be a bit more difficult than it appeared after UK took a 27-7 lead in the third quarter. 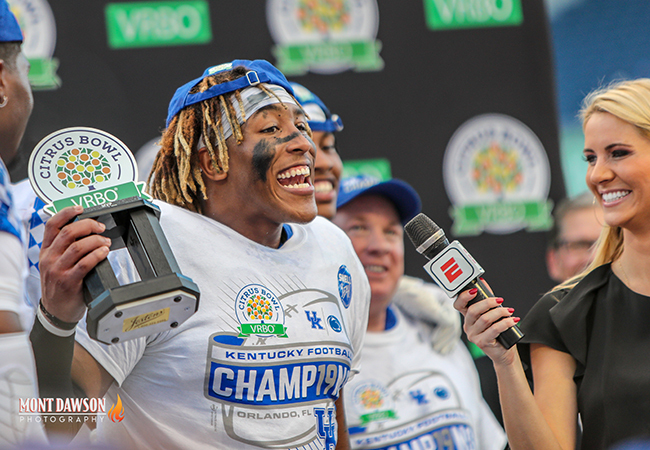 There was a lot to take in, too, from Benny Snell become UK’s all-time leading rusher in the bowl game to Josh Allen playing like a national defensive player of the year should with three sacks and a blocked field goal in his final UK game. 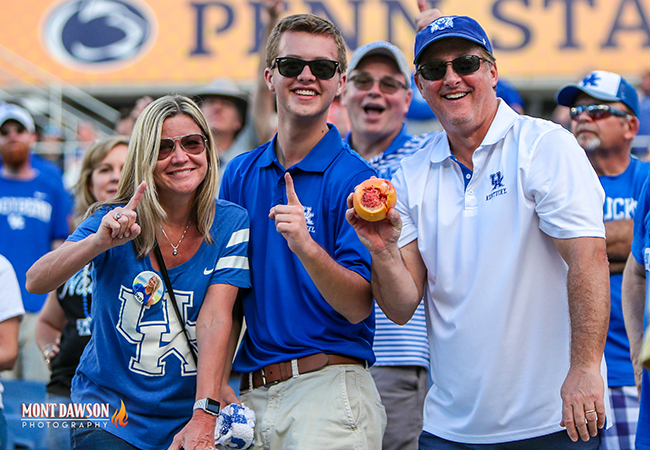 It was why about 30,000 Kentucky fans made the trip to Orlando—including newlyweds Griffin and Sean Ryan who made the bowl trip their honeymoon—to watch this team that no one picked to be in the top 25 or second in the SEC East when the season opened. Yet no matter how often the Cats were an underdog, they found ways to win from ending the 31-year losing streak at Florida to scoring on an extra play after time expired at Missouri. Kentucky also made a statement with its bowl win, the first in three tries under Stoops, that gave Kentucky football a 10-win season for the first time since 1977 and only the third time in school history. Saying farewell to running back Benny Snell is certainly bittersweet for Kentucky football fans. It’s easy to understand why he’s opting to put his name into the NFL draft rather than return for his senior season based on what he’s already done. He’s the first UK player to ever have three straight 1,000-yard rushing season and his 3,729 yards broke the school record set by Sonny Collins in 1975. Those 3,729 yards rank 15th on the all-time Southeastern Conference rushing list and the only SEC players with more than Snell’s 48 rushing touchdowns — a UK record — are Tim Tebow (57) and Herschel Walker (49). Yes Kentucky did and yes he did after he was ignored by Ohio State and others coming out of high school. Remember he also didn’t play his first two games at Kentucky. Once he got his opportunity against New Mexico State after UK lost to Southern Mississippi and Florida to open the season. He ran for 136 yards and four touchdowns and for the rest of his career was UK’s starter and closer. He finished his career with 19 100-yard rushing games, the most in school history, and had at least five 100-yard games each season. More importantly, Snell became UK’s emotional leader and face of the program because he played so well in the biggest games. When UK ended that 31-year losing streak to Florida this season, he ran for 175 yards and had five runs of 10 or more yards. In the win over Mississippi State after a war of words on social media with several State players leading up to the game, he ran 25 times for 165 yards and four touchdowns in UK’s most dominating offensive game of the season. “I just want BBN to know that this group, especially myself, gave our all in practice. Even in games when other teams were smack talking and we were underdogs, we set the record straight about Kentucky football,” Snell said.